This is something of a long-awaited celebration for me; after years of not finding any active free jazz and free improvisation musicians outside of Scandinavia and Ken Vandermark, who himself is connected to the Scandinavian scene at the hip, Utech this year (aside from giving me some top-notch Scandinavian work) shoved my face into the continuously active Chicago scene, right at my doorstep. We'll take a shot at these records in chronological order; though now that I've tapped into the stream (which only takes a few moments at Frank Rosaly's blog and a visit to Heaven Gallery on a Saturday), there will be more coming. I'm a sucker for saxophone and drums duos, which I'm sure has nothing to do with me playing both. They're both wildly flexible instruments, and Rosaly and Rempis here add a solid hour to the infinite spectrum of what the combination is capable without even deviating from a common reference point enough to unbalance the record's coherence. "Cyrillic" is a fitting addition to the free jazz library; Rempis flows everywhere from sentimental flowing melodies that would make Ornette proud ("Thief of Sleep"), through motif-driven spurts, to the kind of screaming, agile chaos that is the hallmark of saxophone in the "New Music" ("How to Cross When Bridges Are Out"). 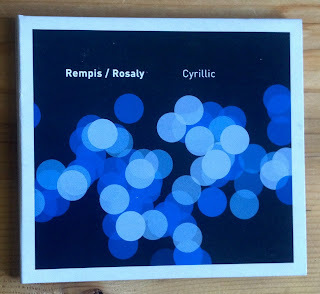 Rosaly, meanwhile, works everywhere from a drummer-friendly progressive polyrhythmic groove ("Antiphonos"), old-school post-bop drumming ("In Plain Sight"), and constantly births wild rhythmic and timbral inventiveness--unusual metallic ringing, rolling chaos, scattered bursts--everything. 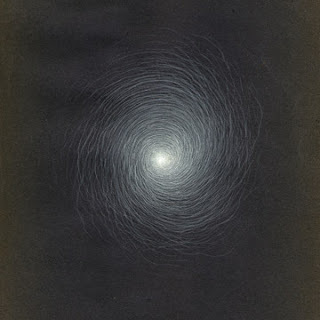 "Centering and Displacement" is another creature altogether. Rosaly here is working as a percussionist only secondarily; the primary artwork is the concrete result of composition with recorded percussion. More in keeping with Utech's patterns of releases, "Centering and Displacement" is a distinctive work that creates its own style. Rosaly worked in this case based on chance arrangements (an appropriate next step for improvised material), organizing spatial and time organization as well as electronic manipulation. The result is hypnotic and constantly enlightening, perhaps closest to Haptic's "Scilens" that found anchor among my favorite works of 2011. This is the sort of thing that appeals to fans of contemporary music and ritual music alike; complexity and difference combining to create an intense atmosphere. Two more records for the "go out and buy this" list. New tab, rosaly cyrillic, new tab, rosaly utech, paypal, buy. Shoo. Labels: 2010, 2012, Dave Rempis, Experimental, Frank Rosaly, Free Jazz, V.